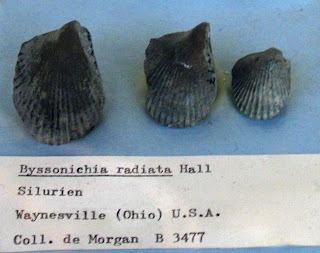 Silurian Period clam fossil found in Waynesville, Ohio stored in Muséum National D'Historie Naturelle Jardin Des Plantes Paléontologie et Anatomie Comparée, Paris, France. The clam is called Byssonichia radiata. UPDATE: Solius Symbiosus of Swimming the Ordovician Seas blog left a comment that this pelecypod should be called Byssonychia radiata. After looking it up I find that is has a new name Ambonychia radiata Hall, 1847 see this for more. Also it appears to be an Ordovician Period fossil and not a Silurian one. Thanks for the clarification.